At the Rogue's headwaters is stunning Crater Lake. Crater Lake is the deepest lake on the American continent and a national park treasure. Spilling from Crater Lake, the Rogue's push to the Pacific Ocean began about a million years ago, when the western part of Oregon was uplifted to form the Pacific Coast Range. It was during this activity that the lower Rogue River was transformed from a quiet stream to a frothing, boiling torrent of whitewater. As the land slowly rose, the river eroded its channel deeper and deeper into the rock until today the canyon averages a depth of over 3,000 feet! 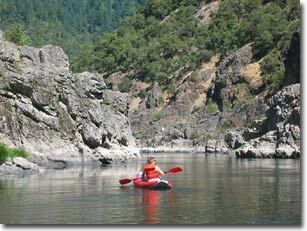 Today, the Rogue River flows are great for rafting and kayaking from late May through late September. 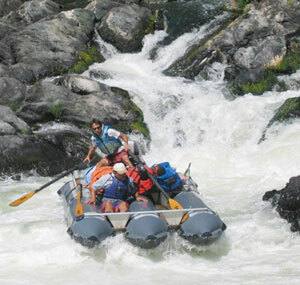 The Rogue River offers its guests over 80 rapids and ripples during the course of the trip. And, because the wild and scenic section of this river is so spectacularly filled with dramatic wildlife and scenery, guests from all over the world come to raft and kayak with experienced guides. White Water Warehouse (WWW) provides first-class trips on this first-class river. White Water Warehouse, a family-owned and operated business, offers families the bet of Rogue River rafting experiences. 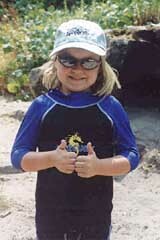 Between the first-class meals (many of the meals are prepared out of WWW's organic gardens), guides that have been with the company for decades, lots of top-of-the-line inflatable kayaks, and the largest number of summer start dates, WWW's provides you and your family with a vacation experience second to none. Check out their unequaled lodge or camp rafting, kayaking, and hiking family adventures today...you can find White Water Warehouse on the web by logging into: www.whitewaterwarehouse.com/ or www.rogue-river-rafting.com. Or, contact their friendly staff at 1-800-214-0579.